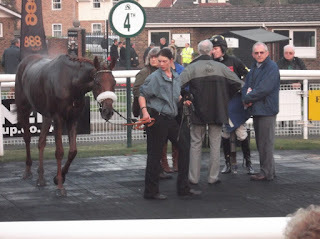 Strategic Action continued his good form today (31/10/2012) when he finished 3rd in a 6 furlong handicap at Lingfield. Ridden by Seb Sanders, he jumped out in mid field until being asked for an effort 2 furlongs out. He started to make progress on the leaders from the furlong pole and moved into a clear third, being beaten a length and a half and earning £251 for his owners. The way he was running on at the finish suggests he might well get 7 furlongs on this surface. The temperatures plummeted overnight making it real National Hunt weather. The owners were quite happy to stay in the warm eating a hearty cooked breakfast (first white pudding for months) before a quick visit to the gallops, in a bitter wind, to watch their horses work. While some cantered on the wood-chip gallop, She's Humble preferred the grass and kept Shannon warm doing several circuits of the fields. Fifi L'Amour earned the first prize money of our new jumps season when she won £124 for finishing 4th in a Conditional Jockeys' Novices' Handicap Hurdle at Fontwell today (24/10/2012).